This story has been hanging around for quite a spell now. I think I have to tell it before I go on. You will understand why when I tell the next one. We had a little trouble because kiwi and skittles didn’t like to stand on the scales. It’s important to get their weight because you need to know immediately if it starts going down. Once they got big enough to step off the scale they inevitably did so. We needed a solution. 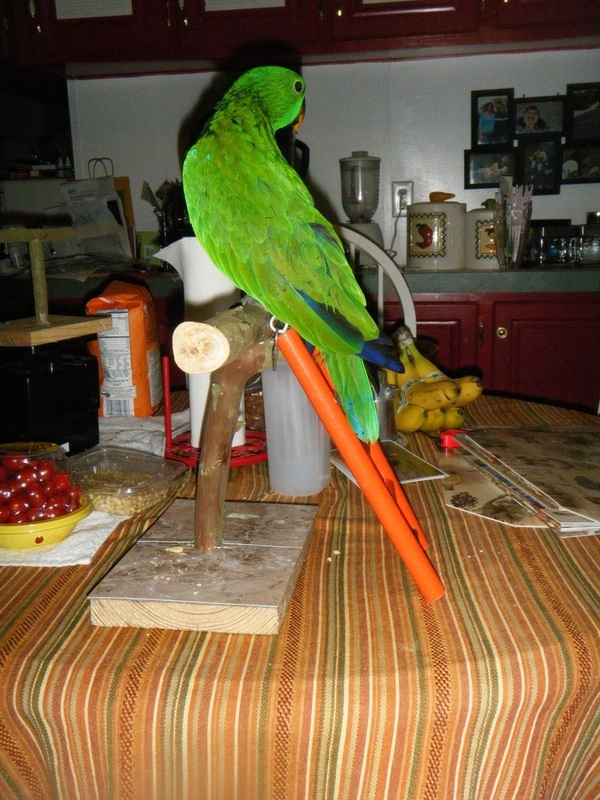 Parrots do not like cold metal objects but stand pretty well on perches. We needed a perch that would fit their feet and fit on top of the scales. You have to start somewhere. We don’t have any hickory trees on the place but we do have crape myrtles. They don't have bark to shave and I can't find any evidence of toxicity. I know what you are probably thinking. 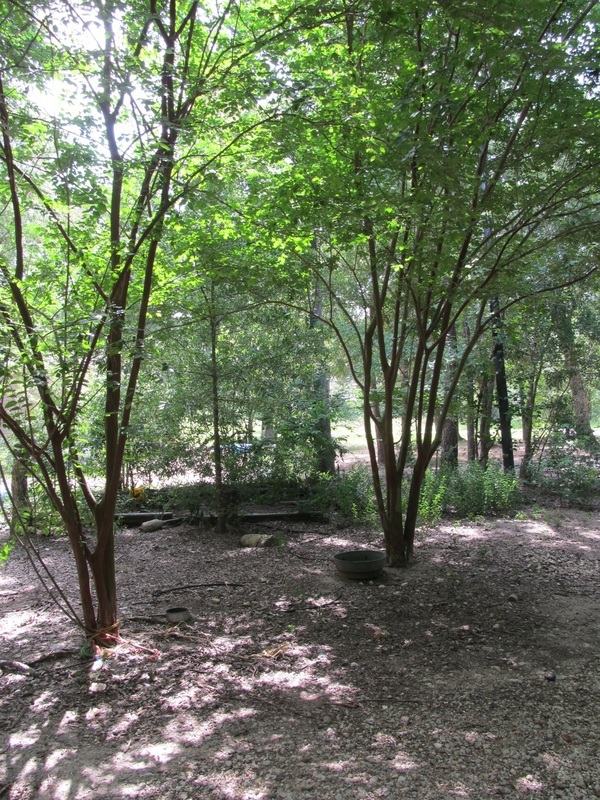 Crape myrtle trunks are too big and they don’t have any branches. Besides, if you take wood from this you will probably kill the tree. It's been cut enough. Well those of you that are city bred are thinking like that. This is a city crape myrtle. I am unsure what purpose they might serve. If you butcher them like this they will stay small but I have some problem dealing with that. This is more what I had in mind. I’m unsure how tall they might be but they are higher than the power lines and I am supposed to cut them back. Some day I will. In the meantime, those two little sucker branches that one is supposed to cut will be ready when I need them. We planted them close to 15 years ago and watered them regularly for the first year. After that we have tended to ignore them. If they are stressed they bloom well so we let them get stressed every summer and just keep them alive. The original trees now have offspring so something must be ok.If you think I planted them 15 years ago so I could make bird furniture today, you obviously don't understand ADD. Where was I. Oh, yeah, the gym. 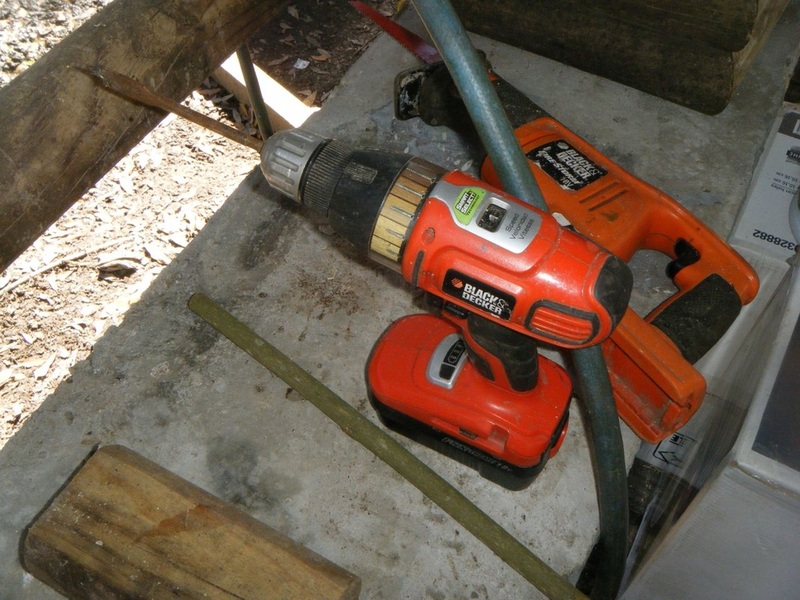 This drill has a spade bit or paddle bit.The picture of the bit is not very good but if you go to your HD or Lowes, they will know exactly what you want. You can buy them in various sizes and a package doesn’t cost much and lasts a long time. 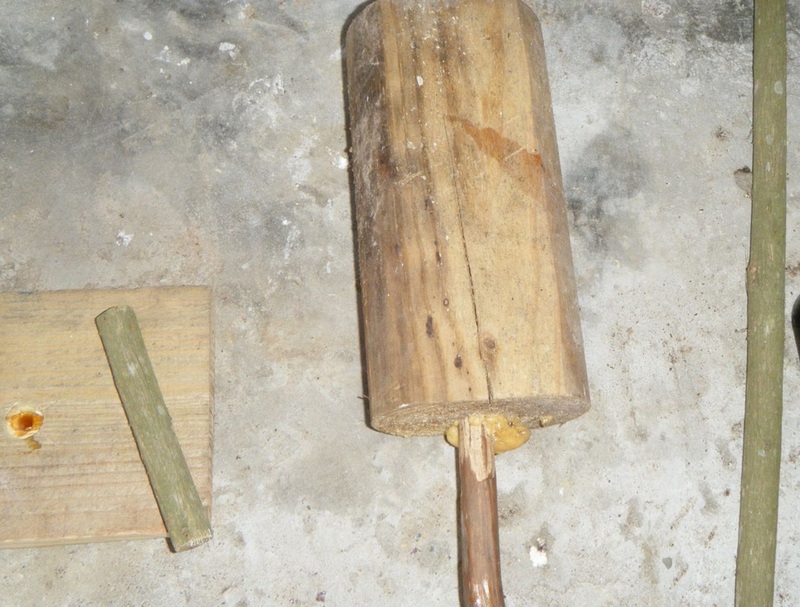 You are in business if your bit is the same size as the stick you are going to use. 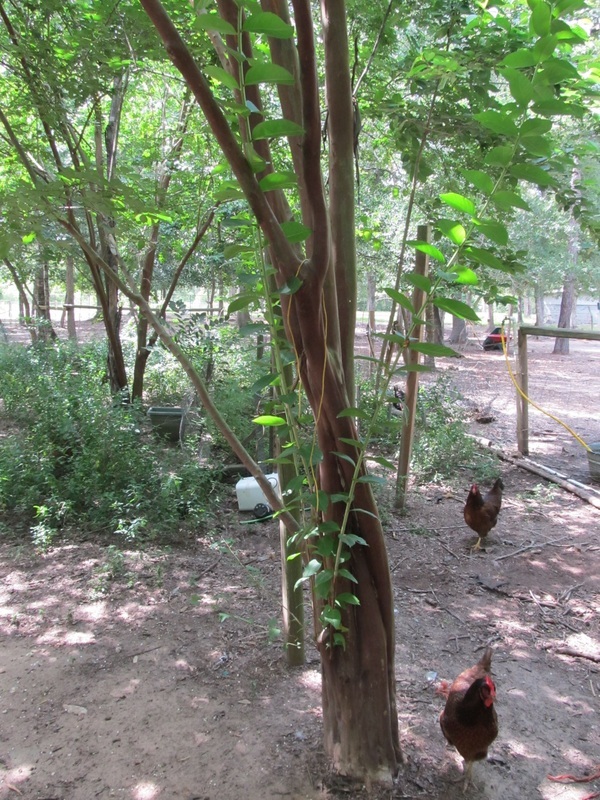 These two are very close and the stick came right off a crape myrtle tree not long before the picture was taken. A few days in the hot sun dry them enough to use. 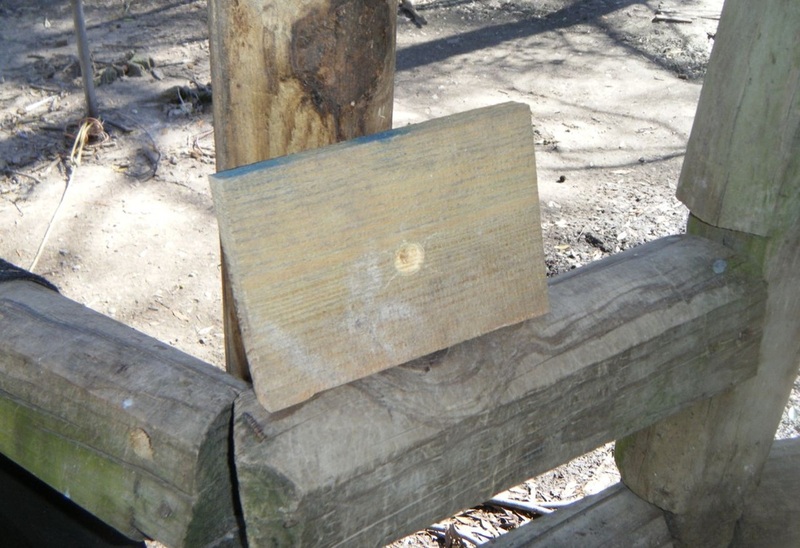 This base plate is a scrap piece of corral board. You can really use anything but 2 inch dimensional lumber is heavy. Go for 1” or off size but fairly thin like corral board. Scraps mean it’s free and that is the most important part. Drawing diagonal lines from corner to corner in the shape of an X will center the hole. 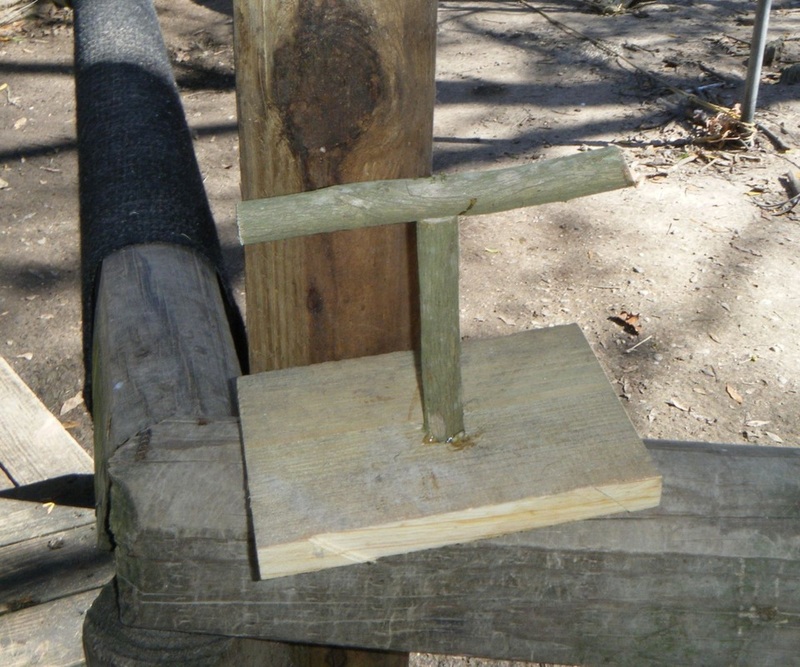 Spade bits come with a point to hold position and the paddle which makes the big hole. With this stuff you may have a small hole on the bottom and that’s ok. Just remember to watch for dripping glue. You may want a sheet of paper underneath the hole. 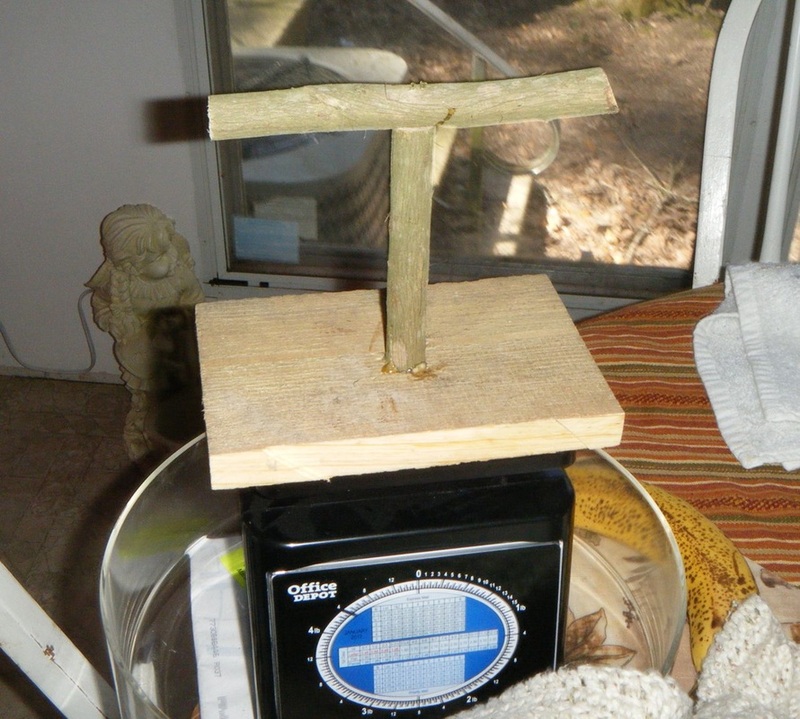 Here you have a wooden hammer that some redneck made (the handle is crape myrtle), the drilled base plate, some glue and the upright stick for the stand. I like gorilla glue but it doesn’t really matter. 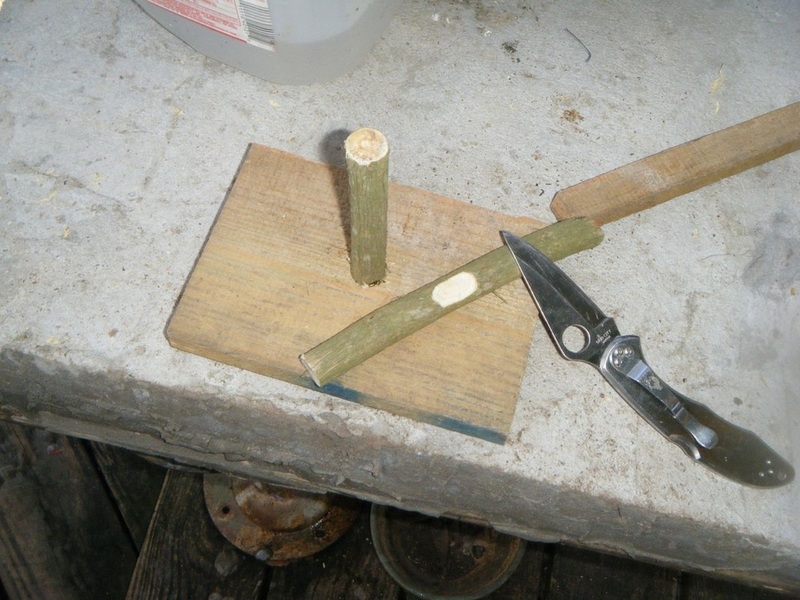 I fit the stick in the glued hole and set it with the hammer. You can let it dry and put a small nail in the bottom to hold it. I use an air stapler and do that while it’s wet. Then just let it dry. When that has dried or sooner if you have it nailed/stapled well, you need to fit the top piece. You need a small flat spot in the top piece. If you are nailing, start your nail before you glue and put the top piece on top. If air brad or stapler just barge on ahead. Make a flat spot, glue it, nail it, wait for a little bit. You are done. This is small enough to fit on the top of a scale. If you use it for more tasks you can glue linoleum tile to the base or paint it with a thick paint. Whatever will clean up well. This keeps our babies quiet and we get a good reading. All you need to do is zero the scales with the stand on them and use it every time. Of course it isn't really very important now that they are grown. The next chapter will discuss something that is. You need a bigger ones when the parrots get bigger. This one is made exactly the same. 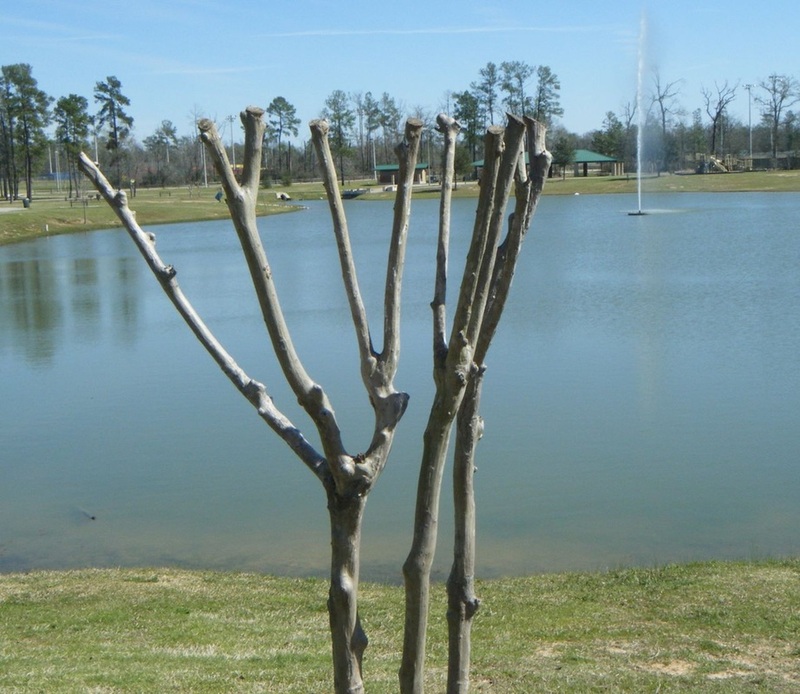 Crape myrtle wood doesn’t hurt birds when they chew it (do not varnish) and it’s pretty tough. The next installment is for when they become bigger and I think an appropriate title would be: “when your parrot gets bored”. Two people who are owned by two parrots.And the parrots are tough taskmasters.